La Canne is a traditional system of French stick fighting that transforms a simple walking stick into a formidable self-defense weapon. Developed during the 19th century by legendary close-combat expert Pierre Vigny, La Canne integrates the skills of saber fencing with the tactics of the cut-and-thrust sword, French savate and boxing to create one of the most complete and effective stick fighting systems ever devised. In Volume 1, La Canne and savate expert Craig Gemeiner reveals the long-lost secrets of this amazing art and presents detailed instruction in its fundamental skills. Gemeiner’s training regimen covers all the basic elements of this combat method, including weapon selection, proper grip, stance and footwork, guard positions, defensive tactics, single strikes, striking combinations, solo and partner training drills and full-speed, full-contact sparring. Volume 2 reveals the secrets of two-handed cane fighting techniques, including the two-handed high guard, the circling guard, flip-and-flick striking tactics, entries and bridging, and the combative use of the cane in close-quarter fighting. Volume 3, also included in this video, takes La Canne methods out of the gym and into the street, demonstrating the situational defensive use of the cane in common attack scenarios. 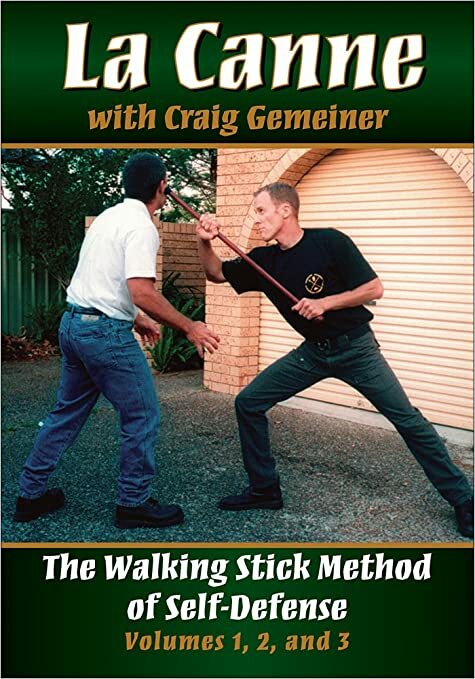 In addition to illustrating the practical self-defense application of La Canne, Gemeiner teaches you how to integrate walking stick and empty-hand tactics into a truly complete self-protection system. Keep yourself safe with this simple, effective and completely legal weapon by mastering La Canne. For information purposes only.